I’m hopeless with a map. Whilst someone in the know can understand that little yellow lines close together indicate steepness, I go into fuzz land when faced with similar. It goes back to school Geography, where the sight of a map used to send me into paroxysms of anxiety only evidenced by those who knew that sweat on my brow followed by my consistent fumbling as I turned the map upside down in a bid to ‘see’ was an indication that I was just not getting the picture. And the map we use is really very helpful. If you look closely it even tells you where there are steps and where it is stony or smooth – kind of them, hey? And it marks all the cairns, caves, picnic spots and even restaurants you might need to patronise after a walk. Nonetheless, it was just as well that even my better half bungled the start of our hike on Sunday. Our intention had been to hike up Echo Valley. Beautiful hike. 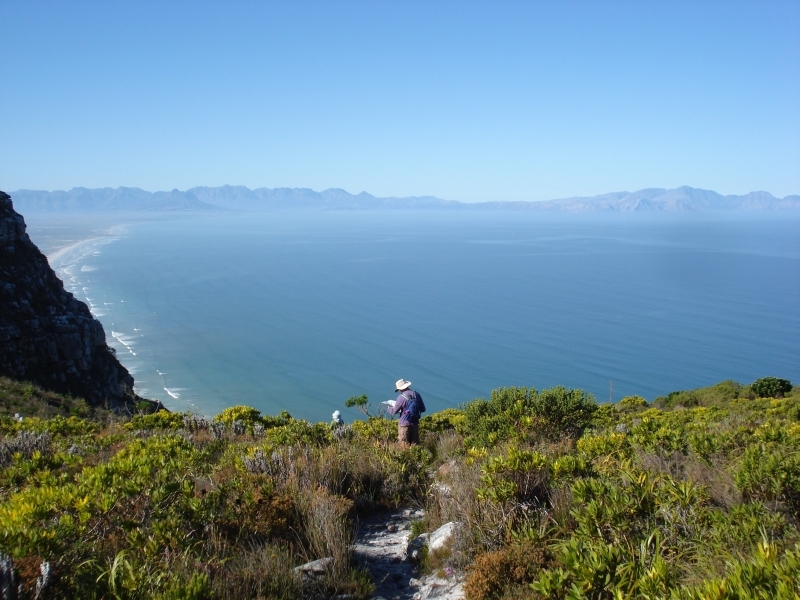 Head up a steep incline above Kalk Bay and then onward and upward climbing along Spes Bona Valley. Lovely. But not with a four-year old in tow. Instead the walk kind of discovered itself and ended up being just perfect, as was the weather – I am ceaselessly amazed at the flawlessness of Cape Town sunny winter days! 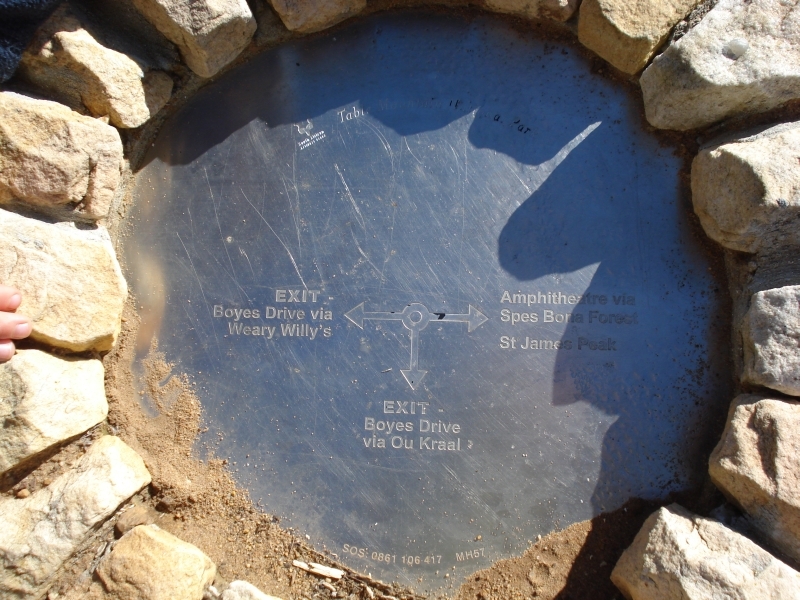 Instead of starting above Kalk Bay at the Echo Valley board, we ventured forth a little sooner above St James at Ou Kraal (just past Bailey’s Kloof sign board) on Boyes Drive. I had already mentally prepared myself for a climb but instead we stumbled on the Old Mule Path that is basically a contour path up above St James and Kalk Bay. Most of the walk is pretty easy and the views are stupendous! Our little one was beside himself and nominated himself as hike leader – wasn’t difficult given that he’s fitter than either of us. From the Mule Path one can see right over False Bay from Muizenberg to Simon’s Town, although not all at once. Only after losing sight of Muizenberg does Kalk Bay and then Simon’s Town make an appearance. Sunday’s sea was a mirror and en route we past a Shark Spotter, his jersey already set aside, as he enjoyed the sunshine. And days like these must make his task particularly easy. A fin would stick out like a, well, like a fin really. And no, he hadn’t spotted a shark yet. Good thing too, as Muizenberg was already teeming with surfers. I made a mental note never to encourage my son to take to the waves! Our path took a slight ascent, after which we reached a crossroads with an accompanying cairn (not the usual assemblage of loose stones; this was cement and stone and indicated the different paths we could follow). Choosing not to wander Willy’s Weary Wait, or ascend into Spes Bona Valley and on to the Amphitheatre, we took a right along another relatively level and well maintained path that took us back on ourselves to St James Ravine via Dog Rock and some rock slabs, neither of which I saw, by the way (but that’s what the map says). Periodically along this route we would meet other parties. The Old Mule Path is obviously extremely popular. 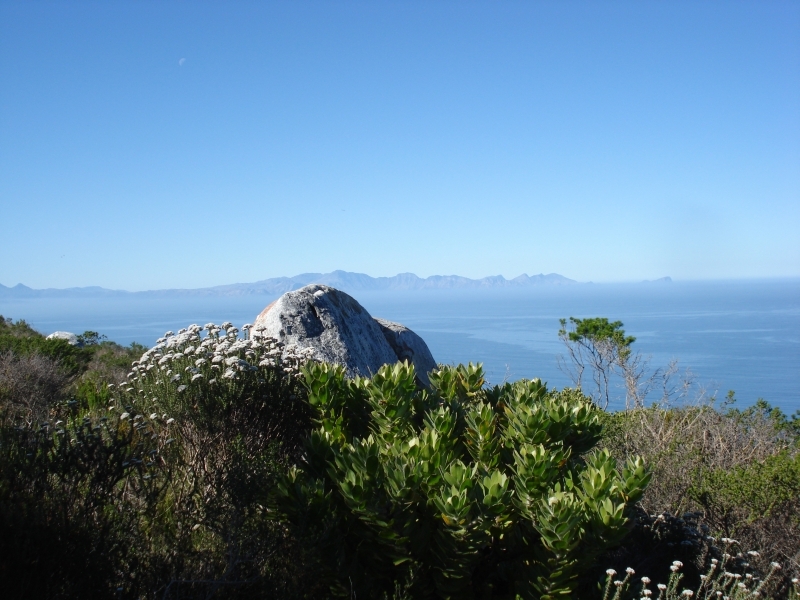 It is also the gentlest ascent of the Kalk Bay mountains and the path winds its way gently and slowly to Ou Kraal. You can walk as far as you like and then turn back, continue on and down Wandering Willy’s Weary Wait (more often than not corrupted to Weary Willy’s) and into Kalk Bay – it appears that Wandering Willy’s Weary Wait is a small weir with huge old wild almond trees. 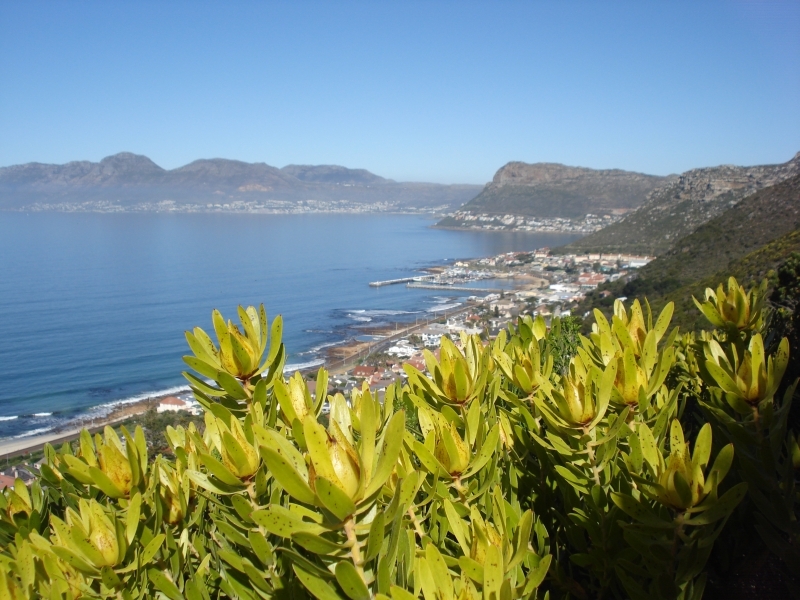 Or you can ascend up further onto Kalk Bay Mountain where there are over 100 caves. Somewhere along our loose gravel path we stopped for lunch. The entire path was teeming with fynbos, proteas – including the King protea, which was a real find – sun birds and beautiful waterfalls and streams. At lunch a few sun birds came in so close to us that you could tell they did not fear humans as the ones in my garden do. Shortly after lunch we joined a Hilltop Path that took us on to Bailey’s Kloof. This is where things got a wee bit hairy. If you want to include this part of the walk then make sure that your children have their wits about them, as it contours a cliff face and a fall here would not be wise. This said, the path is beautifully maintained and rock slabs have been placed as steps to make it easier for you. Descending the cliff face in a diagonal line, we passed a couple of late starters, including a dog in a rucksack, intent on getting up the mountain fast, which you can do if you ascend like this from Bailey’s Kloof. It’s just a real upward trek, so you’ll need to be fit. We were really glad we hadn’t opted for this version of the hike. Safely around the cliff face you’re faced with two options – a steep descent into Bailey’s Kloof, or onward at a more sedate descent back to the Ou Kloof sign, where we started. This descent takes you through cool forested parts of the mountain, alongside a gushing spring, which was a lovely, if cold, way to end the hike. All in all, with more than a couple of stops, the hike took us three hours. in summer don’t leave the hike for midday or later or you will fry!